April is National Poetry Month. 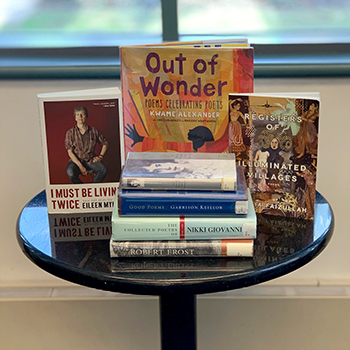 After checking out this month’s Discovery Studio Poetry Month installation at the Quakertown Branch, you might be inspired to read some poetry. Because we couldn’t possibly begin to recommend every worthwhile book of poetry, here is a brief selection to get you started. From classic to modern, for every age, there is a poem waiting just for you and your head. Three contemporary writers pay tribute to the poets and poems that have inspired them. From Langston Hughes to e.e. cummings, these celebratory verses offer a diverse collection accompanied by vivid illustrations. Geological processes and events such as thunderstorms, volcanoes, and glaciers are described using haiku. There is also clear explanatory text that further explores the content of the poems. A classic of children’s literature — with these poems Silverstein address many common childhood concerns and presents purely fanciful stories. This book is a treasure that you can return to throughout your life. Creative wordplay and fun phrases makes this collection a great read-aloud experience. Maya Angelou wrote, “We delight in the beauty of the butterfly, but rarely admit the changes it has gone through to achieve that beauty.” In her poems she admits it all, brings us through it, and shows us what is on the other side. One of the first modern American poets, Emily Dickinson’s strict meter and keen observations set the tone for many poets who came after her. Wystan Hugh Auden was known for his achievements in style and technique, implementing various tones and forms. He wrote on a number of themes from politics and morals to love and loss (such as “Funeral Blues”). Robert Frost is typically among the first on anyone’s lips when asked to name a poet. His depictions of rural life and command of colloquial speech made him universally popular. This urgent, contemporary voice speaks of violence, war, and loss but also of survival, courage, and love. Coming out of the Civil Rights Movement, Nikki Giovanni writes with a fearless passion. This collection shows the transition from angry protests to quiet introspection. Filled with irony and wit, this former Poet Laureate is equally accessible and thought provoking. This eclectic mix of Eileen Myles’s poetry ranges from candidly depicting autumn in New York to the euphoria of falling in love. If you can’t decide where to start, try picking up an anthology. Delivering on the title promise, Garrison Keillor has selected some good poems originally intended for the audience of his radio program, A Prairie Home Companion. An introduction to haiku and other short Japanese poetry by masters of the form, including their history and definitions. If you haven’t felt the top of your head taken off yet, this anthology is bound to do the trick. It covers all ages, languages, and cultures.